Of course the Studebaker National Museum’s new concours will include a class spotlighting some South Bend product or another, and for the inaugural Concours d’Elegance at Copshaholm the focus will turn to Studebaker’s latter-day halo cars, those emblazoned with the Hawk name. The Studebakers in question, the Hawks, debuted in 1956 atop the basic body shells that Studebaker had introduced three years earlier. Those sleek two-door hardtops and coupes–Starliner and Starlight, respectively–commonly attributed to Raymond Loewy, in fact sprang from the pen of one of Loewy’s designers, Bob Bourke, and initially proved a hit with buyers. Yet, as Patrick Foster pointed out in “Studebaker, the Complete History,” by the mid-Fifties Studebaker’s sales had slumped. The company’s merger with Packard brought on James Nance as president and gave it the backing to survive the slump, but Nance needed to turn the company’s fortunes around fast, and he believed a lineup-wide facelift would do the trick. While Vince Gardner reworked the bread-and-butter sedans, Studebaker stylists added an upright grille and taller hood to the Starliner/Starlight siblings in an effort to not only revamp their appearance but also to emphasize the larger and more powerful engines available in the newly christened Hawk line. At entry level there were the Flight Hawk, a six-cylinder coupe, and the Power Hawk coupe, equipped with the prior year’s top engine, the four-barrel 185-hp 259-cu.in. V-8. Then came the Sky Hawk, a hardtop powered by the new-for-1956 210-hp 289-cu.in. V-8, and at the top sat the Golden Hawk, another hardtop fitted with mini-fins and the Packard-sourced 275-hp 352-cu.in. V-8. The lineup got a little simpler for 1957 with just the Silver Hawk coupe and the Golden Hawk hardtop, the former powered by either a six-cylinder or the naturally aspirated 289 and the latter powered by the 275-hp supercharged 289. Fins grew a little taller. 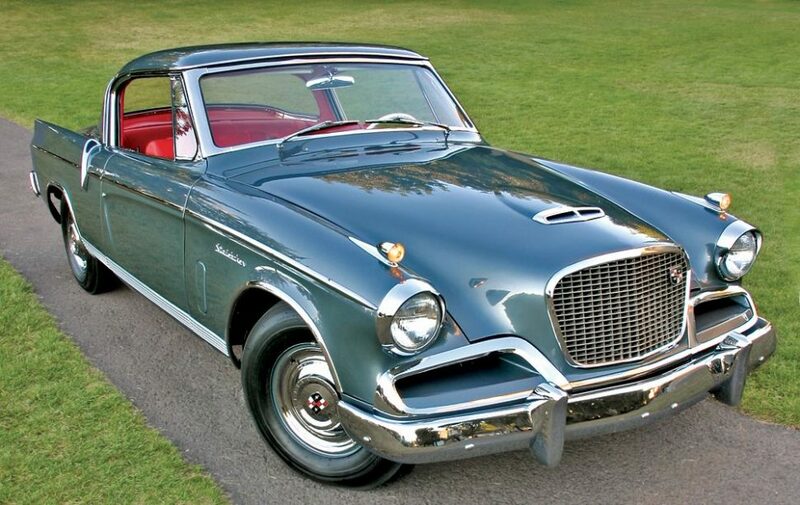 The one-year-only Packard Hawk came along in 1958 and by 1959, Studebaker got rid of the Golden Hawk altogether. A year later, it renamed the Silver Hawk to simply Hawk. Not until 1962 did Studebaker-Packard decide to take the aging coupe/hardtop and give it one last refresh. Milwaukee designer Brooks Stevens, working with a limited budget, shaved the dated fins and firmly acknowledged that the Hawk had been competing directly with the Ford Thunderbird by squaring off its roofline for a more formal profile. Still powered by the 289, the newly christened Gran Turismo Hawk sold for $3,000, or about $1,300 less than the Thunderbird. Other than the addition of the R2 supercharged 289 for 1963, the Gran Turismo Hawk remained more or less the same until Studebaker discontinued the Hawk, along with production in South Bend, in December 1963. As Beckman noted, the new concours will spotlight non-Studebaker makes and models as well. “Our real focus this first year will be on Indiana-based manufacturers,” he said. Other classes include Auburn, Cords, and Duesenbergs; Packards; European Speed; European Style; microcars; postwar American convertibles; and “Never Been Kissed,” a roundup of original and “barn-fresh” cars. The inaugural Concours d’Elegance at Copshaholm, a mansion adjacent to the grounds of the Studebaker National Museum, will take place August 11. For more information, visit ConcoursatCophaholm.org.